Heirloom`s that do not last and why. I often see much loved pieces that are beyond repair and never stood a chance right from their creation. Let`s have a look at one and why. Why is this an heirloom? On a daughter`s 21st birthday she was gifted this ring. It is now a tradition to pass the ring on to the next generation or to have one made. That is a beautiful tradition and no wonder the family hold this ring so dear to their hearts. In April 2017 I wrote an article about most modern jewellery being made in such a way that it is not repairable, a lot like almost everything else we buy nowadays. Ever tried to get a washing machine repaired? You can read that article here but the most important issue with this ring is that to get it to a price point, and/or to achieve a greater profit margin, they reduced the amount of gold used as much as possible. This was a long time ago so the practise is by no means something new. I have catches for chains that weight more than this ring. Even if we say that this ring has worn away half it`s weight over time (not very likely) that would make it a 1 gram ring when brand new! The ring so thin it has broken. I often talk about why I go to a lot of trouble to make sure any new ring I make is to the correct size. This is an article I wrote about the subject. I am assuming from inspecting this ring that it has been resized during it`s life. Resizing a new ring now matter how good you are will thin the ring. When the ring is thin to start with you end up with this. If the ring was thicker at the start of it`s life it would have stood a better chance of actually being an heirloom that someone could wear. Trying to rejoin, straighten or repair a ring this thin is a waste of both time and money. Even a 1mm diameter gem would be too deep for this ring. Yet another article: allow for stone depth. I see a lot of this style of ring that might be a bit thicker but they are still not thick enough to set even the smallest of gems into. You have all seen these rings in jewellery chain catalogues. When I was doing repairs to jewellery purchased elsewhere (which I no longer do) I would often see a brand new ring with the bottom of the gem protruding from the inside of the ring onto the finger. the depth of metal that I just mentioned. 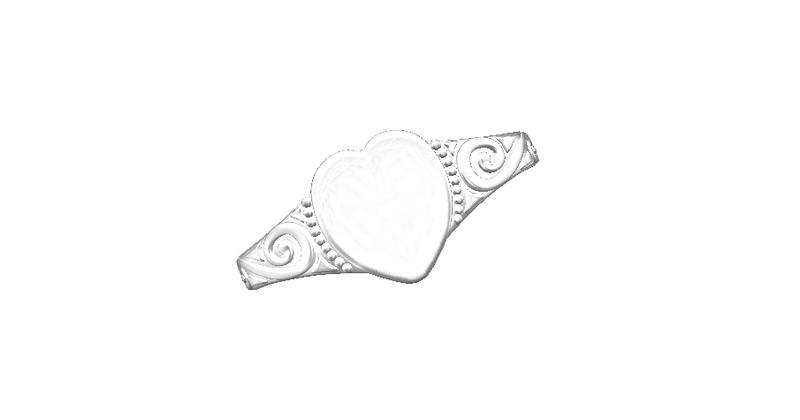 in the dimensions of the existing ring the engraving did not allow for a gem. No room for even a 1mm diamond. This ring is very small at a size H. It was already decided to make the ring thicker and now the decision was made to increase the size of the heart. It might look large in these closeup photos but it is tiny. And yes there is another article I wrote years ago about the importance of scaling a design to your hand/finger size and why jewellery resellers often show rings made to a small finger size in photos to make gems/rings look bigger. The increased thickness to the ring. Larger heart and modified engraving to allow for the gem. Whilst the band in the above photo might look very thick it is just the fact that the ring is a tiny size H, hopefully you read the article in the previous link. A trial run on some scrap silver. Hand engraving is a trade on it`s own. Well done it is a true thing of beauty. Sadly most of the hand engravers are passing away and with most jewellery now machine made to the lowest price point, humans are replaced by machines and there is not enough work to sustain the trade. Normally I do not touch hand engraving but as this was a ring for a family member I took it on. An afternoon was spent practising. This young lady has a family connection to the gem Amethyst and it`s colour. Amethyst is too soft for every day wear so I suggested we achieve the purple colour by using diamonds. Natural white diamonds can be treated to turn them a range of colours and one of those is purple. I liked them so much I purchased a parcel. 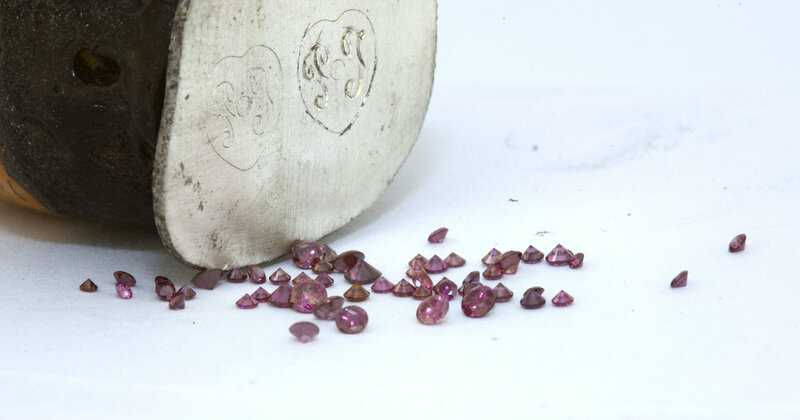 A 1 carat parcel of purple diamonds. The new ring was made in 18ct yellow gold. 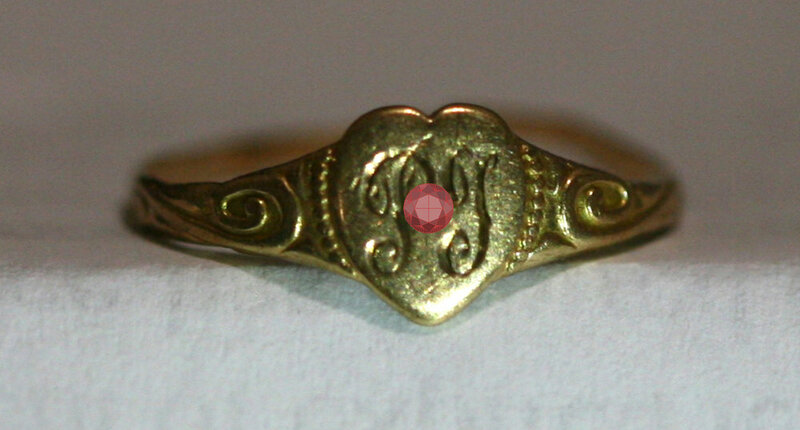 The old ring was 9ct gold and once in the light box you can see it is a bit of a rose colour alloy. 18ct yellow gold ring on the left and 9ct ring on the right. The photo above shows the size increase of the ring overall and some changes that I had to do to the engraving layout to accommodate the diamond. The increased width of the base of the ring. In the next photo above you can see that as well as thickening the ring overall we widened the ring at the base a little as well. To highlight my point about the thinness of the jewellery made for and sold in jewellery chains today, I went out and purchased the thickest standard design I could find being sold by the large jewellery manufacturers that supply most jewellery resellers. It is the silver ring to the left in the photo below. The extra thickness required to securely accomodate a gem visible in the ring I made in the centre. Whilst it is not as thin as the original ring on the right you can see that it is still not as thick as the new ring I made. So why don`t jewellery chains have their rings made properly so that they will last? The fact that the ring will break and that sooner than you expect you will have to buy another one is an added bonus. Original ring weight .5 grams, new ring weight 2.8 grams. You will remember that the original heirloom ring weighed .5 of a gram. The new ring is 5.6 times the original. It should be clear now why they do not make them properly when the public has been accepting this quality for so long. I have no idea why consumers accept this.